Experience a variety of Naval life as you work in the Officers’ Messes both at sea and ashore. Provide first-class service at everything from cocktail parties to diplomatic functions. 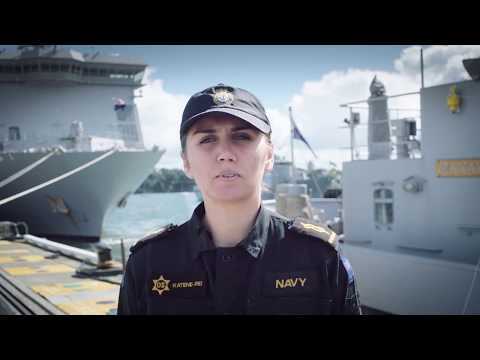 Navy Stewards work in Officers’ Messes at sea and ashore and can expect to serve anyone from the most junior officer in the Navy to Heads of State and members of the Royal Family - for as few as 10 or as many as 200. Your role is varied and includes serving up to three meals a day, bar tending; setting up and serving at official functions including cocktail parties, formal dinners, buffets, and morning and afternoon teas; and providing VIP support to high profile international and diplomatic functions either in NZ or overseas. You will start your career with initial and professional training before gaining experience through practical, supervised on job training while working at the Navy base’s Officers Mess. Postings ashore and at sea will follow and there are opportunities for you to sit external, industry recognised qualifications for the City and Guilds of London Institute. Further training will assist with your professional development and progression in the Navy. If you are involved in Kapa Haka we have our own Marae. You can help keep up traditions in the Defence Force which is really good. Your hard work, experience, and training accomplishments as a Steward are rewarded by promotions in rank and salary. Following your initial training and consolidation, you can reasonably be expected to have attained a basic level of competence within 18 months of joining. This will be supplemented by a sea posting and then further training to prepare you for promotion to a supervisory role. Advanced training will involve both generic leadership skills and development as a steward. Successful completion of these will qualify you for a promotion to Leading Hand whereby you will be responsible for supervising a team of stewards, either at sea or ashore. You will start your Naval Training at the Devonport Naval Base with basic and specialist training. Your specialist steward training will be undertaken at the Defence Catering School where you will learn and develop skills in modern and relevant food service skills. Following this initial training phase, you will complete on job training (OJT) and consolidate in the Wardroom (Officers’ Mess) in the Devonport Naval Base. As you gain more experience, you will post to sea for up to 18 months to become part of a small team onboard a ship that providing stewarding support to the Ship’s officers. As your career progresses, you will undertake further training to develop your generic leadership skills and specialist skills. The ability to manage people effectively and efficient is a key part of your development. This training will provide you with additional skills and expertise to assist with your career progression. Your basic steward training is validated by the award of City and Guilds of London Institute 7066-003 (Certificate in Food and Beverage Service) and Safe Food NZQA 167, 168. Your advanced training, usually completed within 3 – 4 years of joining, is validated by the award of City and Guilds of London Institute 7066-015 (Diploma in Food and Beverage Service). Stewards also receive additional leadership training to assist with their career progression in both a specialist and general role. In addition to Steward training, Stewards are also trained in Advanced Casualty Care. Stewards are part of Ships Medical Emergency Team and respond to medical incidences whether during a training exercise or for real. Be free of any criminal convictions for the previous two years.